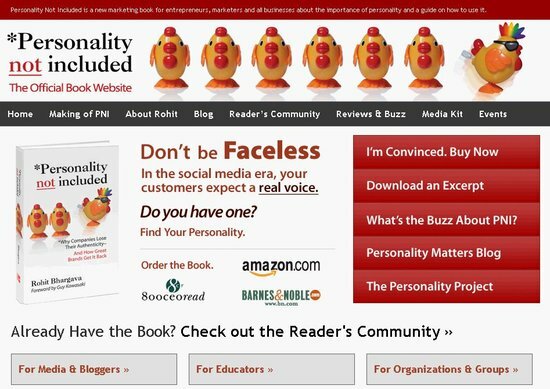 This morning the official website for Personality Not Included quietly launched and I waited for some time to announce it here. As many of you know, I spent the last several days launching the PNI Book Virtual Interviews (a series of more than 50 blog interviews about the book). I had originally intended to come back today with a vote for the best interview, so apologies if you have been waiting for me to run that. I decided due to the number of interviews and fact that some bloggers did not have a chance to get my responses live on their blogs until throughout the day today, that I would wait until tomorrow. At 7am EST tomorrow – I will publish a recap post with learnings from that effort, as well as my picks for the top ten interviews (from which you can help choose the winner). In the meantime, please check out the PNI website and let me know what you think. In particular, I’m interested to know what else you think could be added or any comments on how to improve the site. There is lots more I will be adding there in the coming weeks, so please share your thoughts and see you back here tomorrow!